The match-3 puzzle concept seems simple enough, but its a foundation that can build into a lot of different ideas, even a cooking competition or a fighting game. It’s that malleable mold that forms Rose City Games’ The World Next Door, an upcoming indie puzzle-battle game that looks pretty friggin’ sweet. 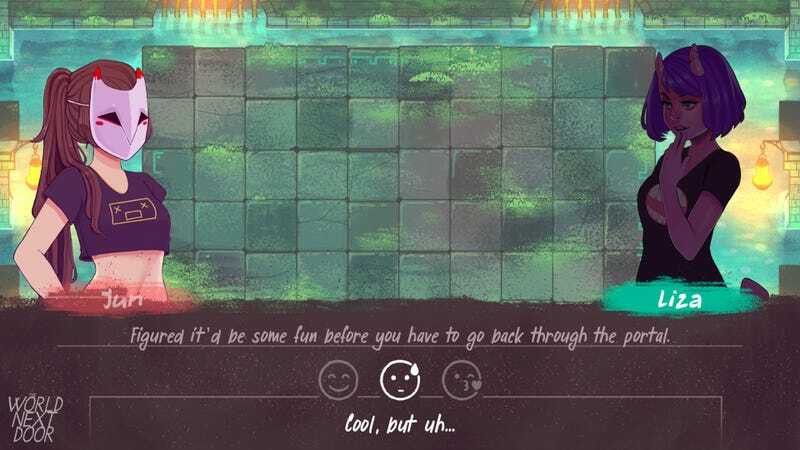 Part narrative visual novel, part action puzzler, the game follows Jun, a girl who wins a ticket to visit a parallel world inhabited by different kinds of monsters and magical creatures. A brief stay naturally turns into a dilemma, as she finds herself trapped in this other world and on a time limit—humans can only last for five days in the magical realm. With the help of some newfound friends, your goal is to find a way to get back to your world while discovering the secrets of the other. The game is broken up into visual novel segments, where you can make choices about how Jun responds to different conversations and eventually, build relationships with each of the ghoulish and extravagant creatures. Marlowe Dobb, community manager for Rose City Games, told me the team drew inspiration from the Persona series, so it’s not too far removed from reputation and social links. 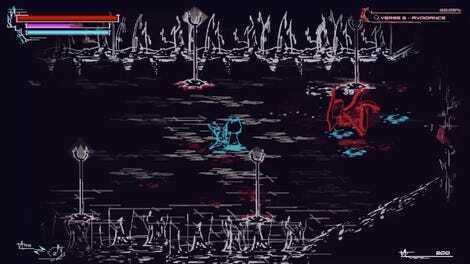 Once battles start, you’re dropped onto a grid of tiles marked by glowing runes. Controlling Jun in the demo, you run around on top of the tiles, tethering and swapping them to form strings of matching runes. Once you activate them, your character casts the matching spell, usually trying to harm your opponent. And on the flipside, your opponent is trying to do the same. It’s not hard to start picking apart the match-3 DNA of The World Next Door. Baby steps of just noticing and connecting matching colors quickly turns into combos, as you discover what each rune does. Purple creates a gravitational pull, sucking the opponent in towards the center; that void ends up pairing well with yellow runes, an area-of-effect shock attack that can do some real damage if you can force your enemy to stand in it. While the computer proved an ample opponent, what I saw at DreamHack Austin today was just a sliver. Associate producer Sandra Lanz told me the team is working on different boards, bosses that can affect the state of play, and different elemental properties for enemies. Being friendly with your monster pals is what will help you maximize on those weaknesses. Spending time with the eccentric cast doesn’t just result in fun interludes, but will let you bring in party members to help with tough foes. The eye-catching art certainly helps draw you in as well. Working with a few outside artists, the look of the game really brings the parallel world to life. It’s both familiar and strange, and the in-game battles are clear and easy to follow, even when the action gets hectic. Plans are only set for The World Next Door to come to Steam at the moment, via Viz Media, but it already looks like it will fill the match-3 shaped hole in my heart (and, hopefully, my Switch).